Google has posted a great page of tips for students to use as they complete their research. This is a great resource and is tremendously useful for teachers as well. Once you have read the tips on this page make sure you check out the 15 second search tips the Google Team has added to YouTube. You may also want to start following the Google Student Blog. 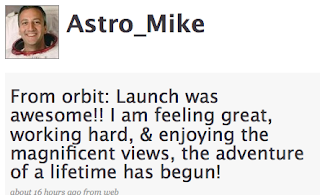 Astronaut, Mike Massimino, is the first person to ever post to the popular micro-blogging service Twitter from space. He's currently on the space shuttle Atlantis heading to make repairs to the Hubble Space Telescope. You can follow Mike Massimino on Twitter by his username, Astro_Mike. Apparently, he does not have his Blackberry with him on Atlantis. He often posts to Twitter with it using Twitterberry. Those roaming charges were probably too much to handle. This post was done from the Twitter web site. Thank goodness there wasn't a fail whale out when he posted!